When it comes to managing poor behaviour among your staff, prevention is better than cure. Setting clear expectations and creating a positive and open culture can go a long way to keeping employee behaviour on track. If a line is crossed, however, you’ll need to manage the misconduct following a disciplinary procedure. Before it gets to that stage, here are a few steps you can take to reduce the risk of staff misconduct. If you expect a certain standard of behaviour from your staff the first thing you need to do is be clear about what your expectations are. Using policies and value statements you can outline standards of performance, responsibilities, accountabilities and the workplace conduct that you expect. If this is the first time you’ve considered HR for your business, don’t panic! We’re here to help with policies such as a code of conduct, and grievance and disciplinary procedures. When onboarding a new employee, make sure you explain the processes that you use should anything go wrong, so they know what to expect should a situation arise. It goes without saying that there’s an element of trust and an employee should not knowingly break the law whilst working for you. Creating an open culture will benefit your business in countless ways, not least in terms of how you handle misconduct issues. When employees feel at ease to speak up about inappropriate behaviour they’ve spotted, then you can address issues quickly and prevent them escalating outside of your business to a potential employment tribunal. To instill this kind of culture, it’s important to lead by example, this can be as simple as communicating and discussing plans with your team, offering informal feedback and generally demonstrating that the channels of communication are open. Try to avoid blaming people when they slip up in some way. If something goes wrong, it will work out better for everyone if your team feel they can speak up without being blamed or shamed (or fired!). A culture of supportive problem solving is far better if you’d like to keep misconduct problems to a minimum and dealt with effectively in-house. 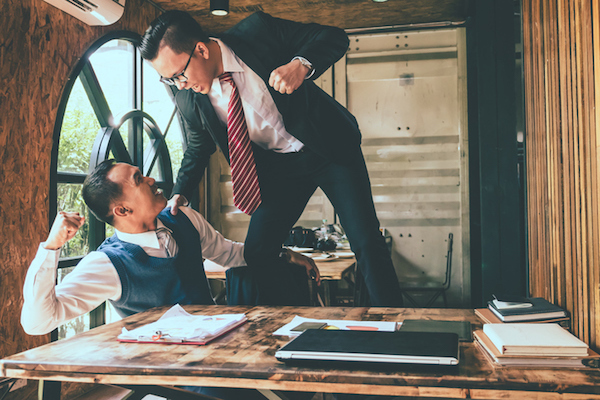 Of course, if an employee is repeatedly causing a major issue or behaving with gross misconduct, this is a different matter, but generally speaking, a calm approach to positively solving poor conduct will mean that you can nip issues in the bud before they get out of hand. If you have a feeling something’s off, then it probably is – rather than brushing things under the rug, do some investigation and you may uncover a very small and easily solvable issue rather than an ugly monster six months down the line. Consistency in your approach is key. Standard procedures make sure everyone is treated fairly, everyone is on the same page and nobody (no matter how experienced) gets to wing it. If someone is behaving in a way that is not consistent with your company values, politely let them know and explain why the behaviour isn’t acceptable. CIPD defines employer brand as ‘…a set of attributes and qualities, often intangible, that makes an organisation distinctive, promises a particular kind of employment experience, and appeals to those people who will thrive and perform best in its culture’. Being clear on this and outlining it in a value statement is a great way to attract the right kind of people to your business in the first place. A statement about certain behaviours, such as working with honesty and integrity clearly demonstrates your brand intentions and instructs staff on how to act from the start. These “rules” will help your team to police their own behaviour. If it all goes wrong despite your best efforts and you feel you have a valid reason to dismiss an employee, it is vital that you follow the correct procedure. If you need further help or guidance on handling a misconduct issue please drop us a line at info@citrushr.com or give us a call on 0333 444 0165. It’s also highly important that you document the entire procedure, our HR software makes this a piece of cake – click here for a free trial.